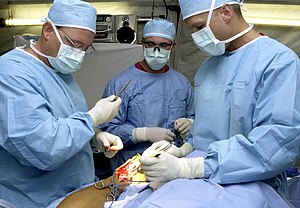 Surgery is an operation that involves cutting, taking out, changing or fixing parts of the human body. Doctors who do surgeries are called surgeons. Many surgeons are experts in certain areas; for example, a surgeon that operates on bones is called an orthopaedic surgeon. Surgery (operations) can be very simple, like taking a tooth out. Surgery can also be very complicated, like repairing a damaged heart. Operating rooms have to be very clean places. The doctors and nurses go to great lengths to keep the room clean where the surgery is done. Regular cleaning of the room and its tools keeps everything clean and germ-free. Everyone in the operating room must wear special clothes, hats, shoes, gowns, gloves and masks that are clean and germ free. The only people allowed there are the doctors and nurses as well as the patient. When people have operations they are normally put to sleep with general anaesthesia. When the patients are asleep, they cannot feel anything. In some kinds of surgery local anesthesia (stopping the pain in the place where the cutting is done) is enough. In recent years, many patients that cannot get the required surgery in their own country, or find the costs too high, travel to another country for medical care. This is called medical tourism. This page was last changed on 8 July 2018, at 22:14.